It has been one year since the Great North American Eclipse, where the area of maximum totality (the sun is completely eclipsed by the moon) spanned across the contiguous United States, from Oregon to South Carolina. While the phenomena has been over for a year, it’s always fun to take a look back and reminisce. Here we will talk about the weather on that day, more specifically, the temperature. If you were lucky enough to be within the area of maximum totality, the August 21st 2017 eclipse occurred for roughly 3 hours, as the moon slowly passed over the sun. Approximately halfway through this period, the sun was 100% eclipsed by the moon, and stayed that way for up to 2 and a half minutes (depending on where you were). On a normal summer day, the incoming solar radiation from the sun is absorbed by the earth, and then sends infrared radiation back into space. Typically, the amount of incoming radiation is higher than outgoing radiation, which is why the temperature rises when the sun is out. When the sun is eclipsed by the moon, it acts similar to nighttime, where the outgoing infrared energy is larger than the incoming solar energy. This is where temperatures can drop during the daytime. Because temperature is one of the most prevalent weather variables recorded on earth, it’s very easy to find out how much the temperature dropped during the eclipse. Recently, a study was published showing temperature drops using a dataset known as the Climate Reference Network (more on this network another day in a future segment I’m calling Alphabet Soup). Another dataset is known as ASOS, which stands for the Automated Surface Observing Systems. It is a joint effort between the National Weather Service (NWS) and the Federal Aviation Administration (FAA), and they have installed thousands of weather stations at airports in the United States. If you’ve watched the weather report on your local newscast, these are typically the official observations for your city. Data is recorded every hour, and in some cases, it is recorded in 20, 5 and even 1 minute intervals. Because of the numerous stations recording temperature information every few minutes, it makes sense to take a closer look at this dataset in the context of the solar eclipse. So what was the weather like on August 21st, 2017? Below is a snapshot of weather conditions at 2pm eastern (11am western), which is around the time the moon was passing over the sun. Most of the country experienced conditions favorable for viewing the eclipse. The eastern half of the United States experienced a high pressure which indicated clear, cloud free conditions for the eclipse. A frontal system draped over the upper midwest, which initiated cloud cover, precipitation, and poor visibility in the states of Minnesota and Wisconsin. While this boundary draped over areas of the northwest, much of Oregon, Idaho and Wyoming saw little to no clouds as maximum totality occurred. Snapshot of frontal boundaries and pressure systems at 18 UTC (1pm Eastern Daylight Time). Source: NOAA’s Weather Prediction Center. Using over 2,300 ASOS stations, temperature observations were gathered and analyzed before, during, and after the eclipse. Temperature differences during this time were noted and plotted on the map below. Overall, most of the country experienced some sort of temperature drop, especially in the southeast. While impressive, some stations only saw a drop in temperature because of increased cloud cover, and not the solar eclipse. This was especially true in the upper midwest, where a frontal system was in the area. Luckily ASOS stations record more than just temperature. They also depict cloud cover and precipitation. Out of the nearly 2000 stations that recorded a temperature drop, 600 experienced no precipitation AND no cloud cover during the eclipse. So, out of those 600 stations, where was the best place to see the eclipse? According to the ASOS dataset, that occurred at the Western Carolina Airport (KRHP) in Andrews, North Carolina. This area saw 100% obscuration during maximum totality (thin brown line above, where the sun was completely eclipsed by the moon), no precipitation, no cloud cover, and a 10.8 degree drop of temperature during the day of the eclipse. According to the temperature time series below, which recorded observations every 20 minutes, the temperature was 88.0 degrees F around the the time the eclipse began (1:05 pm) and dipped to 77.2 F just shortly after totality (2:45 pm). While cloud cover was reported earlier and later in the day, none was reported during the period where the moon was passing over the sun. 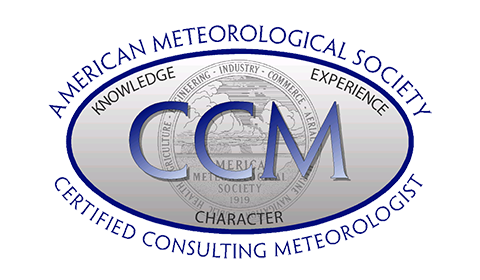 Temperature, cloud cover, and precipitation recorded on August 21st, 2017, at Western Carolina Airport (KRHP) in Andrews, NC. Times the eclipse began, ended, and period of maximum totality are noted. This analysis was performed with colleagues at the North Carolina Institute for Climate Studies, which is part of NC State. An interactive map showing temperature drops in your area can be found here. Missed the eclipse last year? Well don’t panic, another one is coming in April 2024, so don’t forget to bring your thermometers! Under the right conditions, you could experience a total eclipse of the heart (sun...I mean...sun).